Finchley Road is a London Underground station at the corner of Finchley Road and Canfield Gardens in the London Borough of Camden, north London. It is on the Jubilee line, between West Hampstead and Swiss Cottage and on the Metropolitan line between Baker Street and Wembley Park. It is in Travelcard Zone 2. The station is 100 yards south of the O2 Shopping Centre. It serves the Frognal and South Hampstead areas. It is also a five-minute walk from the Finchley Road & Frognal station on the London Overground's North London Line, and this is marked as an official out-of-system interchange. 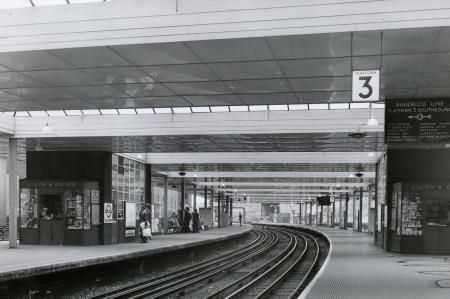 The station is in a cutting covered by a single glass and metal canopy and is the northernmost station below street level on the line. 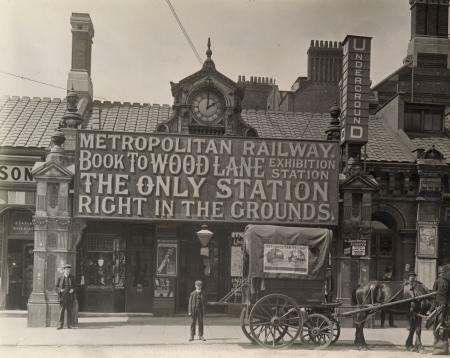 The station was opened on 30 June 1879 by the Metropolitan Railway (MR, now the Metropolitan line) on its extension from its now closed station at Swiss Cottage (a different station from the current Swiss Cottage Jubilee line station). The station was rebuilt in 1914 with entrances incorporated into a new parade of shops. Finchley Road was also the name of a nearby Midland Railway station which closed in 1927. The remains of these platforms are visible from Thameslink trains running on the Midland Main Line. Looking north along the Jubilee line platforms. Finchley Road is served by London Underground Jubilee and Metropolitan line services. 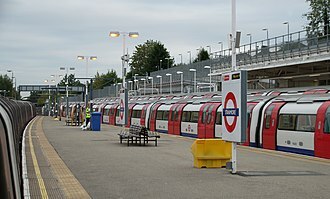 The Jubilee line, which is a stopping (or local) service, operates a service frequency of 16 tph (trains per hour) between Stanmore and Stratford. The Metropolitan line offers "stopping services" (with some peak hour "fast" and "semi-fast" services) (no Metropolitan line services stop at stations between Finchley Road and Wembley Park) from Aldgate and Baker Street to the north-west of London and certain stations in the home counties. 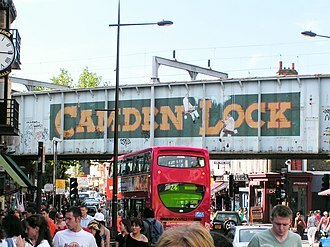 London Buses routes 13, 113, 187, 268 and C11 and night route N113 serve the station. 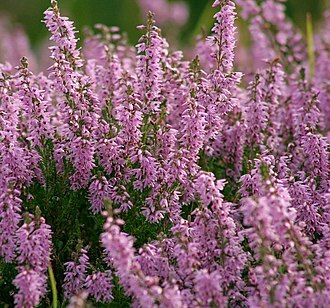 ^ "British Isles: A Natural History". BBC. Archived from the original on 2004-09-15. 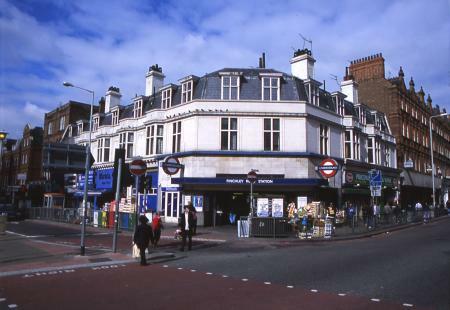 Wikimedia Commons has media related to Finchley Road tube station. 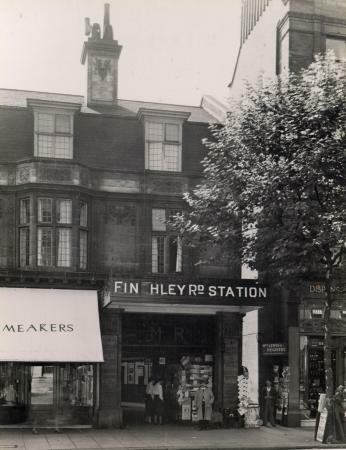 "Finchley Road station, Canfield Gardens entrance, 1933". railwayarchive.org.uk. Finchley Road, an inner city main road which runs for about 7 kilometres, is one of the major thoroughfares of north London, England. Originally named Finchley New Road, it was built as a road in the late 1820s/early 1830s to provide a by-pass to the existing route north from London through Hampstead. The Hampstead route contained two steep hills either side of Hampstead Village and was difficult for horses carriages to negotiate when muddy. The new turnpike was built at the time as the improvements which created Regents Park. It started from what was called the New Road and ran north. As the road crossed the boundary of Finchley, its name became Regents Park Road, the turnpike ended when it joined the Great North Road as Ballards Lane. There was a tollgate at Childs Hill, after construction, many grand houses were built along its length, especially near to what are now Fortune Green, Childs Hill and Golders Green. It was once served by Finchley Road railway station on the Midland Main Line and it is still served by Finchley Road tube station and Finchley Road & Frognal railway station on the North London Line. North London is the northern part of London, England. 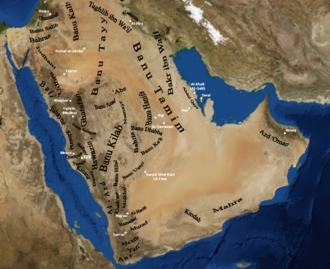 It is a description and the area it covers is defined differently for a range of purposes. Common to these definitions is that it includes districts north of the River Thames and is used in comparison with south London, however, it is often used in comparisons with central London, east London and west London. The River Thames divides Greater London into two parts, the northern part includes most of the historic central areas including the City, the East End and the West End, and the majority of the London Underground network. This definition is used by the Boundary Commission for England, the London Borough of Richmond upon Thames includes sections on both sides of the River Thames. The boundary commission class the entire district as part of South London, for the purposes of the London Plan, there has been a north London subregion in operation since 2004, originally consisting of Barnet, Enfield and Waltham Forest. In 2001 this area had a population of 1,042,000 and this definition is used by organisations such as Connexions. In 2008 it was amended to consists of Barnet, Enfield, Haringey, Islington, in 2011 it was amended again to consist Barnet and Haringey. This list includes all boroughs included in the Boundary Commission area, north London has, like other parts of London and the UK in general, a temperate maritime climate according to the Köppen climate classification system. Four Met Office weather stations collect climate data for London north of the river, Heathrow, Northolt. Long term climate observations dating back to 1910 are available for Hampstead and this both hilltop and urban position means severe frosts are rare. Occasionally snow can be seen to lie towards the Chilterns while central London is snow-free, typically the warmest day of the year at Hampstead will average 29.3 °C with around 14 days in total achieving a value of 25.1 °C or higher. 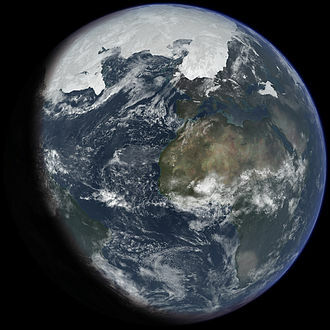 The average coldest night should fall to −5.6 °C, on average 35.8 nights will report an air frost, some 119 days of the year will register at least 1mm of precipitation, and on 7.4 days a cover of snow will be observed. Stratford is a major multilevel interchange station serving the district of Stratford and the mixed-use development of Stratford City in the London Borough of Newham, Greater London. On the Underground it is a through-station on the Central line between Mile End and Leyton, and it is the terminus of the Jubilee line following West Ham. On the DLR it is a terminus for trains and for others it is a through-station between Stratford High Street and Stratford International. There are limited services operated by c2c between Liverpool Street and Shoeburyness via the London and Southend Railway. From 2019 the full Crossrail service will replace TfL Rail, linking Stratford to other stations in central London as well as Reading, the station was opened in 1839 by the Eastern Counties Railway. Today it is owned by Network Rail and is situated in Travelcard zone 2/3, Stratford served as a key travel hub for the 2012 Olympic and Paralympic Games held in London. By the most recent National Rail entry and exit figures, it is the 6th busiest station in Britain, the Northern and Eastern Railway opened a section of its authorised line from Broxbourne to join the ECR at Stratford on 15 September 1840. As well as a station, a railway works was built adjacent to the line to Broxbourne and this and the engine shed expanded into the area to the west of the station which is now occupied by a shopping centre and Stratford International station. The ECR tracks were set to a gauge of 5 ft on the recommendation of engineer John Braithwaite. This choice meant that the Northern & Eastern Railway who were planning to share the ECR line between Stratford and Bishopsgate were forced to adopt the same gauge, at the same time the associated Northern & Eastern Railway was converted. New station buildings were built in 1847 replacing the structure on Angel Road. These were located in the V between the Cambridge and Colchester lines and access was via Station Road, the line through the low level platforms first opened in 1846 as a goods only branch as far as Thames Wharf. The bridge under the line was too low for many locomotives. On opening there was a line that linked what is now known as the Great Eastern Main Line directly to the docks enabling through running from Colchester to Thames Wharf, the docks and associated railway networks expanded with passenger services to North Woolwich starting in 1847. Aldgate is a London Underground station which serves the Aldgate area on the eastern edge of the City of London. 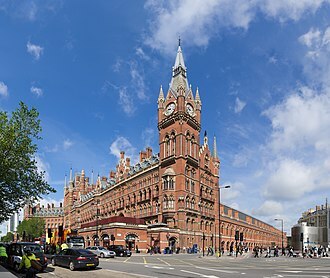 It is situated within the City ward of Portsoken, which neighbours the Aldgate ward, the station is on the Circle line between Tower Hill and Liverpool Street, and it is the eastern terminus of the Metropolitan line. It is in Travelcard Zone 1, Aldgate was opened in 1876 with its entrance on Aldgate High Street. A station named Aldgate East opened nearby eight years and is served today by the District, construction was complicated because the station was on the site of a plague pit which contains an estimated 1,000 bodies. 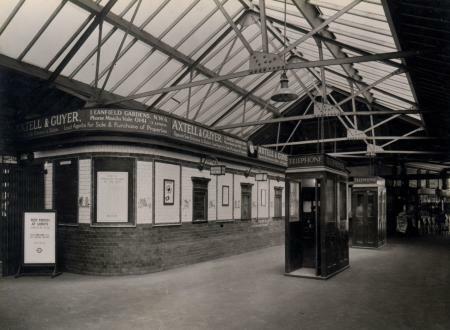 Aldgate station was opened on 18 November 1876, with an extension to Tower Hill opening on 25 September 1882. Services from Aldgate originally ran further west than they do now, reaching as far as Richmond and it became the terminus of the Metropolitan line in 1941. Before that, Metropolitan trains had continued on to the termini of the East London Line. In 2005, one of four suicide bombers involved in the 7 July terrorist attacks detonated a device on a C-stock Circle line train from Liverpool Street and was approaching Aldgate, seven passengers were killed in the bombing. Of the stations affected by the bombings, Aldgate was the first to be reopened, once the damaged tunnel was repaired by Metronet engineers, the lines were reopened. This allowed the Metropolitan line to be restored, since the closure had meant all trains had to be terminated two stations early, at Moorgate. On the Circle line the typical off-peak service measured in trains per hour is,6 tph clockwise to Edgware Road via Embankment,6 tph anti-clockwise to Hammersmith via Kings Cross St. Pancras. On the Metropolitan line the typical service in trains per hour is,2 tph northbound to Amersham,2 tph northbound to Chesham,8 tph northbound to Uxbridge. 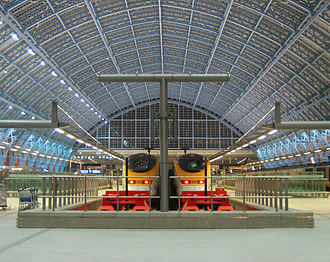 During peak hours there are additional fast and semi-fast Metropolitan line services, with following the route to. London Buses routes 25,40,42,67,78,100,115,135,205 and 254, bus route 25 has a 24-hour bus service. Aldgate station plays a role in the Sherlock Holmes story The Adventure of the Bruce-Partington Plans, in the story, the body of a junior clerk named Cadogan West is found on the tracks outside Aldgate, with a number of stolen plans for the Bruce-Partington submarine in his pocket. Baker Street is a station on the London Underground at the junction of Baker Street and the Marylebone Road. The station is in Travelcard Zone 1 and is served by five different lines and it is one of the original stations of the Metropolitan Railway, the worlds first underground railway, opened in 1863. On the Circle and Hammersmith & City lines it is between Great Portland Street and Edgware Road, on the Metropolitan line it is between Great Portland Street and Finchley Road. On the Bakerloo line it is between Regents Park and Marylebone, and on the Jubilee line it is between Bond Street and St. Johns Wood, the station has entrances on Baker Street, Chiltern Street and Marylebone Road. Nearby attractions include Regents Park, Lords Cricket Ground, the Sherlock Holmes Museum, the station layout is rather complex. The sub-surface station is connected to the open-air Metropolitan line station, below this is a deep-level tube station for the Bakerloo and Jubilee lines. These are arranged in a cross-platform interchange layout and there are connections between the two lines just to the north of the station, access to the Bakerloo and Jubilee lines is only via escalators. With ten platforms overall, Baker Street has the most London Underground platforms of any station on the network, of the MRs original stations, now the Circle and Hammersmith & City line platforms five and six are the best preserved dating from the stations opening in 1863. Plaques of the Metropolitan Railways coat of arms along the platform and old plans and photographs depict the station which has changed little in over a hundred. Restoration work in the 1980s on the oldest portions of Baker Street station brought it back to something similar to its 1863 appearance. The Metropolitan lines platforms one to four were largely the result of the rebuild in the 1920s to cater for the increase in traffic on its outer suburban routes. 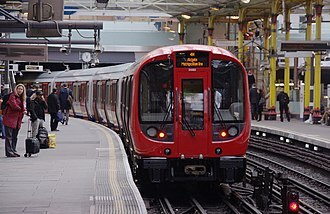 All Metropolitan line platforms can function as terminating tracks however under normal circumstance only dead ended platforms one, the Bakerloo line uses platforms eight and nine date from 10th March 1906 when the Baker Street & Waterloo railway opened between here and Lambeth North. The contraction of the name to Bakerloo rapidly caught on, by the mid-1930s, the Metropolitan line was suffering from congestion caused by the limited capacity of its tracks between Baker Street and Finchley Road stations. The Bakerloo line took over the Metropolitan lines service to Stanmore on 20 November 1939, following refurbishment in the 1980s the original tiling scheme was replaced with tiles depicting the silhouette of Sherlock Holmes who lived at 221B, Baker Street. In 1999 the Jubilee line was extended from Green Park to Stratford, the design of the Jubilee line platforms at Baker Street has changed little since being opened with illustrations depicting famous scenes from Sherlock Holmes cases. Cross platform interchange is provided between Bakerloo and Jubilee lines in both directions, in 2008 TfL proposed a project to provide step-free access to the sub-surface platforms. The project was a TfL-funded Games-enabling project in its investment programme, the project was included in the strategy on accessible transport published by the London 2012 Olympic Delivery Authority and the London Organising Committee of the Olympic and Paralympic Games. The home counties are the counties of England that surround London. The counties generally included in the list are Berkshire, Essex, Kent, the origin of the term home counties is unknown and no exact definition exists, making their composition a matter of constant debate. The earliest use of the term cited in the Oxford English Dictionary is from 1695, the term is sometimes understood to mean those counties which, on their borders closest to London, have been partly subsumed into London. 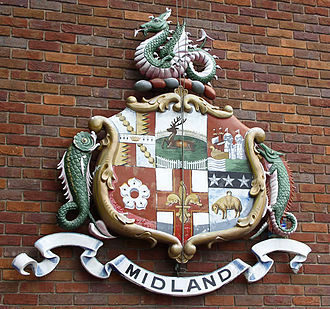 Indeed, the county of Middlesex has been almost wholly within London since 1965 as have parts of Hertfordshire and Surrey. The third edition of the Oxford English Dictionary defines the term as the English counties surrounding London and they comprise chiefly Essex, Kent and Hertfordshire. Parts of all of historic counties are, since 1965, officially within London. An additional theory is that the derived from the Home Circuit of the courts of Assize which contained Hertfordshire, Kent, Sussex. The Home counties were described by one 1987 reference book as being inhabited on the whole by nice, comfortable, in fiction and Jerry Leadbetter of the television sitcom The Good Life, set in Surbiton, represent a typical home counties suburban couple. The home counties as a whole are more prosperous than other parts of the United Kingdom. The towns of Amersham, Gerrards Cross and Beaconsfield, all in Buckinghamshire, were ranked as the top three most expensive in the country in one 2008 survey of average house prices. The area is so large, that it includes a number of areas of deprivation such as Margate, Hastings. 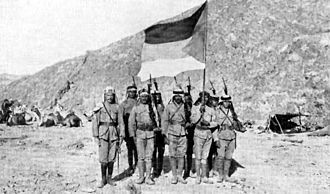 Multiple definitions of the term have been used in legislation and by official bodies, in the twentieth century, for instance, as follows,1908, The Home Counties Division of the Territorial Force comprised units recruiting in Middlesex, Kent and Sussex. 1920, The London and Home Counties Electricity District consisted of the counties of London and Middlesex,1924, The London and Home Counties Traffic Advisory Committee, covering the London Traffic Area, London and parts of Buckinghamshire, Hertfordshire and Surrey. 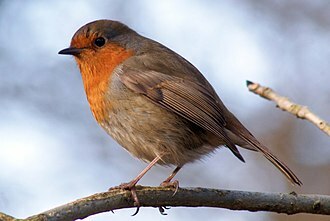 1926, The Home Counties Licensing Act regulated activities in all parts of Buckinghamshire, Hertfordshire, Kent,1938, Green Belt Act limited development in parts of Middlesex, Buckinghamshire, Essex and Hertfordshire. Metropolitan line train at Farringdon bound to Amersham. A southbound Bakerloo line train arrives at Platform 8. The Home Counties Magazine, 1899, a magazine "of the "topography of London, Middlesex, Essex, Herts, Bucks, Berks, Surrey, and Kent".